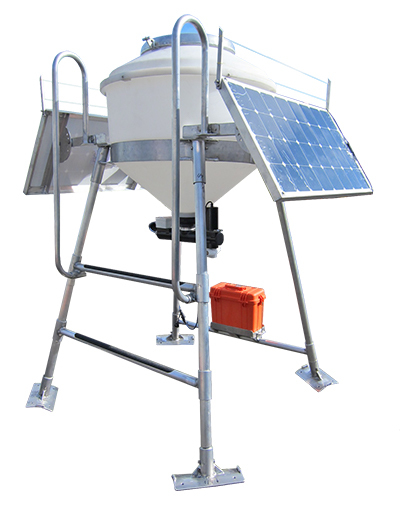 The Aerite™ S250 Feed spinner is a robust electric feed spinner that attaches to any Aerite™ model 200 kg or 500 kg feed hopper and can be placed in a pond, on a barge, or on floats in a sea pen. 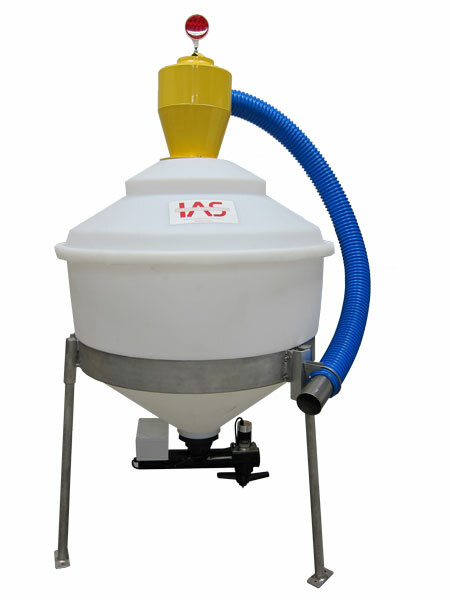 The Aerite™ Feed Spinner dispenses dry feed pellets 360-degrees, up to 30 meters diameter. This wide area of feed spread reduces competition and stress contributing to better size and uniformity of growth. 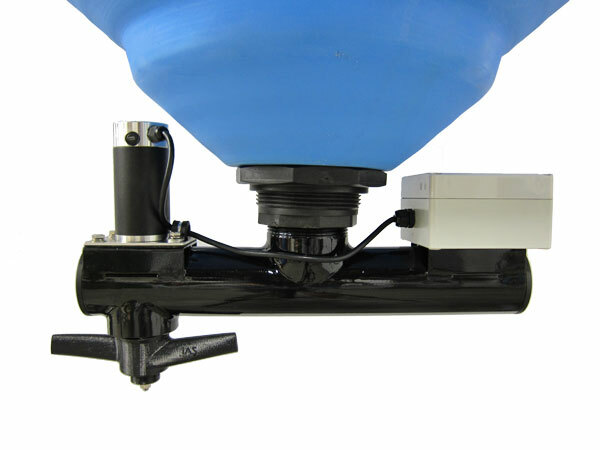 Close-fitting interface between hopper outlet and feed spinner provides optimum spinner nozzle elevation above water for best feed trajectory and coverage. Aerite™ Feed Spinners interface with a wide 76.2 mm / 3” Aerite™ hopper outlet with no internal ledges or flat surfaces for uninterrupted feed flow resulting in accurate Feed Conversion Rate data tracking. Feed quantity, dispensing frequency, and duration can be controlled using FeedMaster™ PLC controllerfor 24/7 feeding. Refill hopper manually or integrate with Cyclonic Decelerator and MiniMax™ Feed Delivery System to refill from shore or barge. Wide attachment face provides a stable Aerite™ Feed Spinner mounting interface. No need for support straps and hardware. Aerite™ Feed Spinner tucks up close to hopper for best protection. Sturdy aluminum body construction will not corrode and requires no regular maintenance. *Aerite™ spinner nozzles for larger feed sizes for feeding fish are available. **With nozzle change, higher rates available for feeding fish. ***Based on 3mm feed pellet. ****Current draw up to 7 amps when dispensing larger feed density/pellet size. Specifications subject to change.